In order to streamline cheque clearance and processing, RBI has stipulated that banks must now make use of Cheque Truncation System or CTS from the new year. This has also been necessiated to ensure better security and scanning for safer transactions. 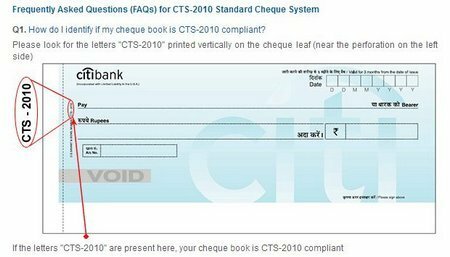 The main difference between CTS and non-CTS cheque books would be the words CTS-2010 mentioned vertically on the top left part of the cheque and a grey patch below the account number space on the cheque towards the left bottom. An illustration of such a cheque from Citibank and ING Vysya Bank are as shown below. These cheques are already into circulation and some of you might already be having the same if you have ordered a cheque book recently. However for those who do not have this yet, your old cheque books and leaves would be considered void and unusable after this month end. 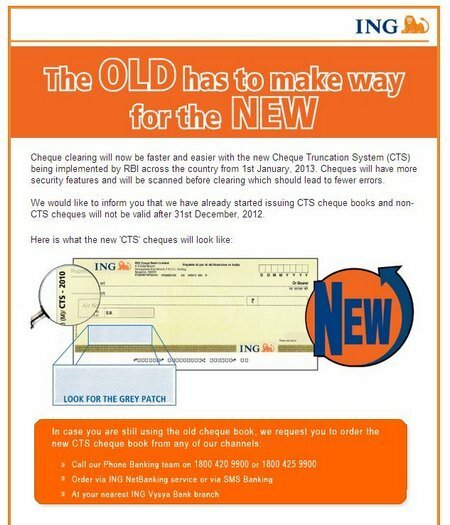 To avoid your cheques being dishonored, you can get a CTS compliant cheque book from your bank as soon as you can to start making use of the new system that is rolling out from the next year.